The L-banner is supplied with an aluminium clamping profile at the top and bottom. The L-banner has a total weight of 3.2 to 3.8 kg and is easy to transport in the supplied bag. The L-banner is suitable for indoor use. The L-banner is printed on a 510 gr. PVC fabric. The 510gr/m2 PVC fabric is UV resistant and comes with a B1 fire-resistant certificate. 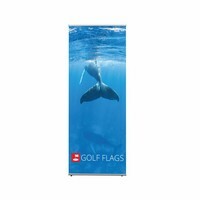 The L-banner is available in two different widths; 80 cm and 100 cm. The height is 200 cm.